The moment packets hit the Router’s internet Interface, they become at what is called WAN. Understanding WAN Technologies and why Networks were divided to Local Area Networks (LAN and Wide Area Network (WAN) will help you distinguish among what I call Packet Carriers Technologies which carry generated Packets among Network devices from hop to hop. 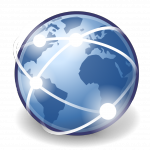 WAN originally formed by Tele Providers, nowadays, provided by Internet Service Providers (ISP). Besides, WAN and LAN naming convention when used in the a Design scratch, will make it easy to understand the Network design. Nowadays, mainly the Ethernet (which initially was used as only Local Area network) is the de facto protocol across LAN and WAN Networks. Inside Our Home and Office Network called LAN, and outside (after the Router Edge) called Internet or WAN. 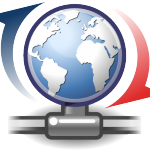 Internet for instance, is basically a combination of Multi different WANs (Routers) locations. ISPs WANs connected together with other ISPs WANs Edge Routers. Initially, WAN was mainly used to connect 2 apart locations such campus buildings or branch offices. One of the main differences between home LAN and WAN, that you don’t need to pay for your inside home LAN a monthly fee since you own the switch and the cables inside your home. However, you need to pay to lease a WAN connection – similar to your internet fee at home but of course more money when it comes to business leased line such T1 or T3 (These days FIOS or Cable for business). The cables that run between the buildings and under the ground as infrastructure are owned by the ISP provider (The ISP Company), hence, you lease and pay a fee to use the ISP infrastructure. Virtual Circuit (New style unlimited Virtual Connections) through Frame Relay Cloud, started on late 90’s. 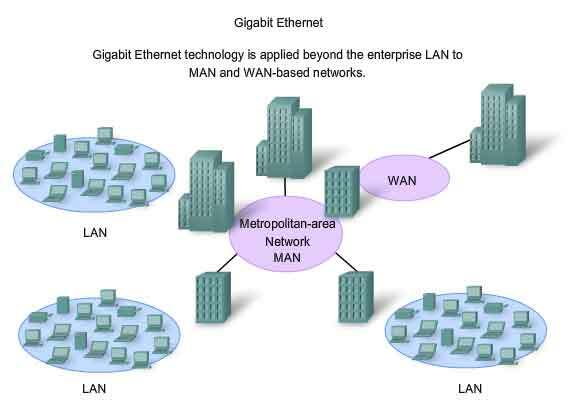 And recently, because of the Fiber-Optic’s longer cable length used today, Ethernet through MPLS can provide us with WAN connection as well, hence, using the same standards of LAN. However, many people today use the generic term Service Provider or Internet Service Provider (ISP) to refer to company (Telco Company– Old Term) that provides a form of WAN, including Internet services. A Lease Line between 2 routers is just a Crossover Cable similar to an Ethernet Crossover cable but LAN Crossover Cable has distance limitations, rather, a Lease Line can go for miles because of the Technology used by ISP provider. Using the Frame Relay or the New EoMPLS technology, routers can send Full-Duplex at anytime over the leased Line, for tens, hundreds, or even thousands of miles. Besides, the speed is Symmetric, meaning, R1 and R2 send and receive bits at the same speed. In business connections, Synchronous refer to the Upstream and the Downstream which is equal at all times. Equal Down and Up stream is required by businesses especially if they have Web-Servers in-house which makes it more expensive than home Cable or DSL, where it is Asymmetric and Asynchronous connections, hence, the Downstream is more than the Upstream. Initially, the main purpose of WAN networks is to move data between company’s LAN Networks securely. In 1990’s and before the internet Sun shine, companies used private lease WAN networks between their Main office and branch offices for secure communications. These days, Virtual Private Network (VPN) is being used such L2TP or IPSec between branches replacing physical Leased lines. Back then, the only way was to lease a private T1 line which in fact was more secure than VPN, however, imagine how much would be the cost to have your ISP dedicate a circuit only for you. A private lease line will be connected to the router using special WAN card (Main office), then will go through the ISP dedicated circuit back to the branch office. The following figure shows a Main Office and branch Office Network using private Leased Line. Initially, the WAN technologies were using HDLC and PPP technologies, nowadays, most of the WAN Technologies use EoMPLS, and guess what, some businesses went back to a private lease line concept as well, but using virtual EoMPLS private lease line. Nevertheless, still VPN cheaper than a dedicated virtual EoMPLS private lines, and not all businesses can afford a private dedicated EoMPLS connections between their branches. Long time ago in the 1990’s and when the WAN started, there was special component to run the leased line. We can compare this component to a Cable Modem or DSL modem, nowadays. The following summarizes what was needed in terms of component in order to connect to a Leased Line from the customer’s end. 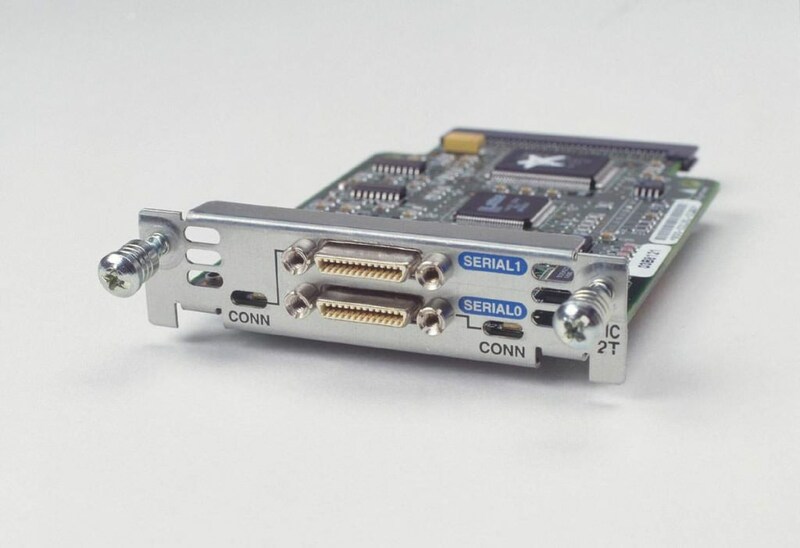 Nowadays, many routers use serial interfaces usually exist as part of a removable card on the router, called WAN interface cards, and the CSU/DSU became built in inside those removable interface cards. The following figures show how the CSU used to be a separate box and how later it evolved to be part of the card itself. 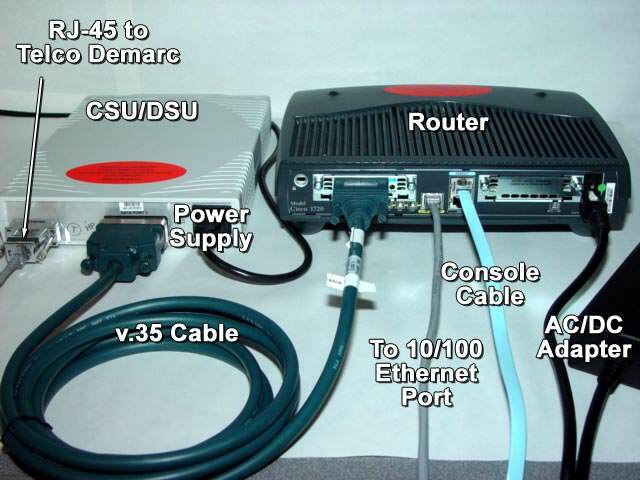 As shown in the above figure how the router connects through a v.35 serial cable and that’s why it’s called serial port. This figure shows the serial card interface with 2 serial ports; serial ports are used to connect to CSU/DSU. And as you can see from this figure, there is no need for a Modem any more. 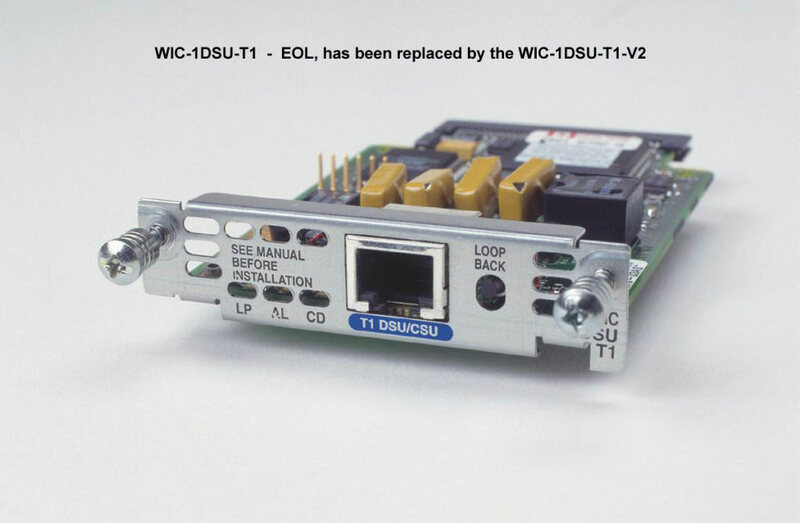 Rather, will be RJ-45 cable comes straight from the wall (the Telco connection) and plugged in the T1 DSU/CSU port as shown in the figure WIC-1DSU-T1 which got Built-In CSU/DSU. ISPs offer a wide variety of speeds for leased lines. However, a customer cannot pick just any speed. Instead, the speeds follow the standards of an age-old technology called the T-carrier system. Bell companies also developed time-division multiplexing (TDM) technology that let them combine multiple of these base speeds onto a single line. For Example, one popular standard, a Digital Signal Level 1 (DS1, or known by T1, combines 24 DS0s which is equal to 64Kbps each plus 8Kbps overhead into one physical line that runs at 1.544Mbps. And you can get faster speed of multiples of T1 as well (Up to 28 T1 lines), which became T3 at speed of 44.736Mbps. (T1 and T3 are Symmetric/Synchronous connections that provide upstream and downstream at the same rate with same speed both ends. A good advantage of a Leased Line or T1/T3 is the dedicated bandwidth you gain when you sign for such service since it is a symmetric. The Internet Cable modem and most DSL are asymmetric connections that share the bandwidth among the customers. It is worth to mention that some Telco companies these days provide a Fiber Optic service such Verizon FIOS which is very similar to a Leased line in terms of speed and bandwidth, for instance you can subscribe for 20Mbps as Upstream and Downstream from FIOS and available to home and businesses. The CSU controls the speed; either it is separate box or built-in Interface card that plays a big role in the leased line speed. If the customer subscribed for a fractional T1 which could be 256Kbps, and rather than giving the customer T1 speed, the CSU controls the speed at a fractional rate through something called Clocking. Tells the router when to send and receives bits, and at which rate of impulse or Clock. Similar to the Wall Clock that ticks every second at certain rate. The clocking in this case is measured by an electrical impulse, meaning, if a customer subscribed for a fractional T1 than the rate of the clock is slower than fully 1.544Mbos T1 rate. Which means, the router won’t be able to send or receive data unless it sense the clock rate, slower clock impulse=fractional T1, Faster Impulse=T1 and so on. The clock rate is measured and configured by the Telco Company Engineer based on or per Lease Lines Packages. 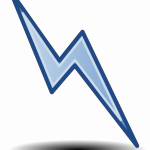 The end that connects to CSU Box called Data Circuit-terminating Equipment (DCE) which controls the speed. Other end called Data Terminal Equipment (DTE) connects to the router. Basically, we are connecting 2 routers in here, but what’s happening: instead of leasing a Line to study, we are simulating a Leased Line. One end acts as ISP CSU equipment that provides Clocking (Rate Control) and another router’s end acts as our Router in the office. By connecting 2 routers as shown below, you can create a WAN link for testing using serial interfaces using one DTE and DCE combined cable. 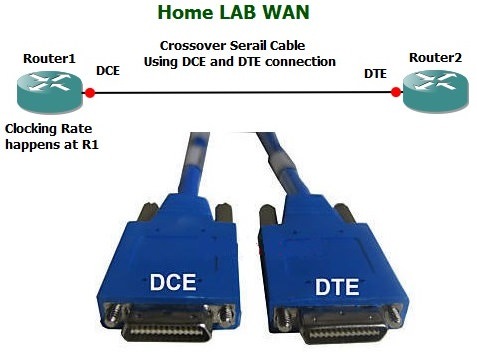 The DCE/DTE cable does the same thing as Ethernet crossover cable between like type devices (switch connected to switch). The router with the DCE cable installed must provide clocking rate. A router serial interface can provide clocking, but it can do so only if a DCE cable is connected to the interface and by the configuration of clock rate command. Note: that the more recent version of IOS, when the router notices a DCE cable connected to a serial interface, even with no clock rate command configured, the router automatically add a clock rate command automatically so the link can be used. "Understanding WAN Technologies", 5 out of 5 based on 2 ratings. CCNA HUB Founder, Imad has been in IT field since 2007. Currently holding A+, Network+, Server+, Security+, and Storage+. HP, Dell, and IBM Hardware Certified. 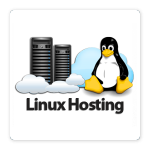 Pursuing Linux+, LPIC-2, RHCSA, RHCE, AWS, CCNA, and JNCIA. We're glad you have chosen to leave a comment. 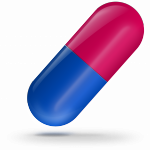 All comments are moderated according to our comment policy. Use your real name and not keywords in the name field. Let's have a personal and meaningful conversation.